Preheat oven to 375°C. Line a 40cm X 30cm baking tray with parchment paper. Beat eggs and flour with electric mixer on medium speed for 3 minutes, then beat on high speed until volume is doubled. Pour in melted butter and whisk for 10 minutes. Spread batter evenly onto baking tray and bake for 12 minutes. Once done, set the cake aside to cool. To make the hazelnut frosting, whisk egg white at medium speed while boiling the sugar in water. Once boiled, pour the sugar mix into the egg white. Continue whisking until smooth, then slowly add cold butter cubes and whisk for 10 minutes. Once blended, add in hazelnut paste and whisk for another 3 minutes. 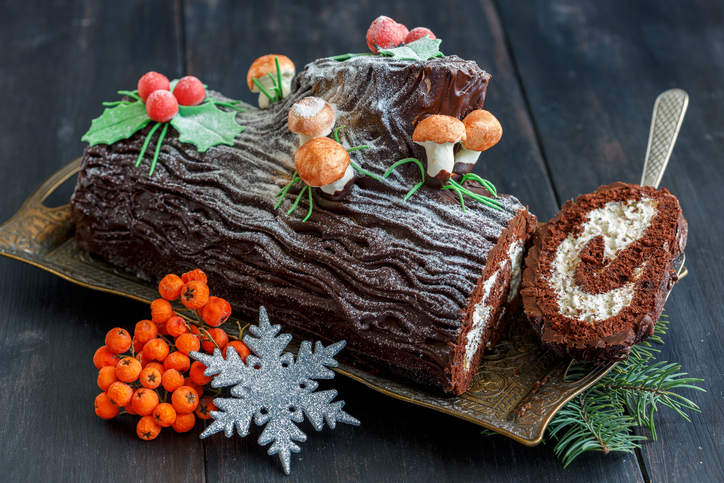 Spread some hazelnut frosting evenly onto the cake, then carefully roll it into a log shape. Refrigerate cake until ready to frost. Spread remaining hazelnut frosting over log cake. Decorate the top with a dusting of icing powder.